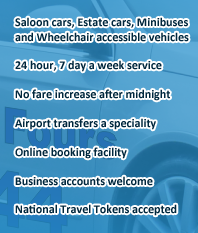 Minicab Services or Five and Five Fours as we are more commonly known, commenced trading in 1973, and is one of Colchester's oldest and most established taxi and private hire companies. We operate 24 hours a day, 7 days a week, everyday of the year and can fulfil all your personal or business travel needs. Our taxi fleet includes saloon cars, estate cars, minibuses and wheelchair accessible vehicles. Are you a Business customer? If so you could enjoy the benefits of using our Account facilities. Payment for all fares in a given month will be invoiced to you at the end of the month for payment within thirty days of invoice date. In addition, our state-of-the-art computerised reservation and taxi despatch system allows business customers to book their own cabs online, amend any previously entered bookings and even track the progress of your taxi on a live map. If you would like to discuss the possibility of opening an account, please call us on 01206 578787. In accordance with HM Government legislation, all of our vehicles are strictly No Smoking. Our taxi despatch system enables you to pay for your cab by Credit or Debit card whilst in the cab. Long distance bookings such as airports, made in advance, can also be paid for by Credit/Debit card. If you are looking for a Colchester taxi service that you can depend on call 01206 544444. Can I just say a very big thank you. I was worried about which company to use to take me to Heathrow but I am very pleased I chose MCS. They were prompt and the driver was very helpful.